Bahá’í study circles are regular gatherings of people who are interested in learning more about the Bahá’í Faith and their own spiritual transformation through systematic study. These courses are open to anyone age fifteen through adult. Each course examines certain aspects of the Bahá’í Faith and provides a framework for assisting the participants to develop their own God-given talents and capacities so that they may use those skills to assist in ongoing community development. 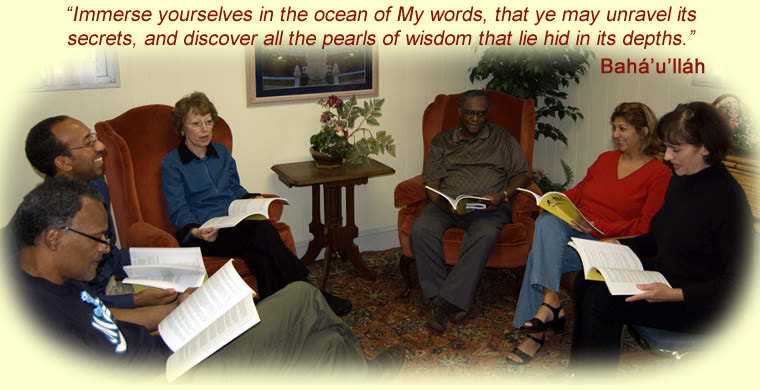 The study circles, which take place in people’s homes and in other locations (such as the public library or Bahá’í Center), are provided in a variety of formats which include regular weekly meetings (of about 2 hours duration each) over a period of several weeks as well as more time-intensive courses that take place over a period of several days. Study circles are forming all the time in the greater Greenville area in order to meet the needs of those who wish to participate. To request a study circle please complete an on-line form. You may also contact us by email, or phone.